SOS receive the most amazing thank you letters each month but this one was a joy to receive and really high lights what the charity does with the support of you all! 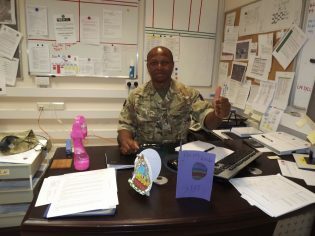 I am currently serving in the British Army and am on Ops in the Middle East. My story with Support Our Soldiers (SOS) began by a “word of mouth” introduction from a colleague. I had already spent one month in theatre before learning about the exceptional work that SOS perform in supporting UK service personnel on deployments. Out of curiosity, I sent a request to SOS informing of my interest in receiving some support and gave my name, rank, number and Op name in theatre. Needless to say that I was pleasantly surprised to receive a reply only 2 days later from a Charity Trustee informing me of the inclusion to their list. My first parcel arrived just after Easter and is one of the best gifts I have ever received. 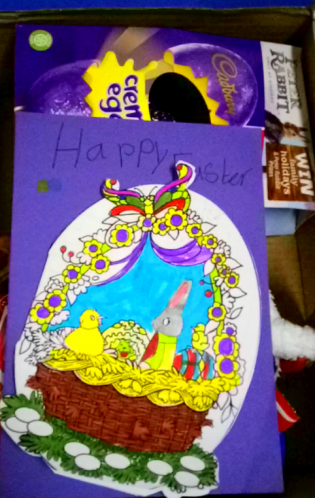 It contained 2 lovely Easter cards created by kids from Denny Primary School, Scotland and some amazing treats including Easter eggs. I was so pleased with my gifts and even remember having a video call with my partner, showing her my gifts as I unwrapped the box. I promptly wrote a letter of thanks to Lynn O’Brien whose sterling efforts enabled the receipt of the parcel possible at my location and also informed SOS of the good news via email. Since then I have received another parcel and can honestly say that the support given through the time and effort from volunteers such as Lynn is a true testament to the SOS ethos with the support of service personnel on deployments. Please keep up the excellent work and thanks for putting a smile on my face!